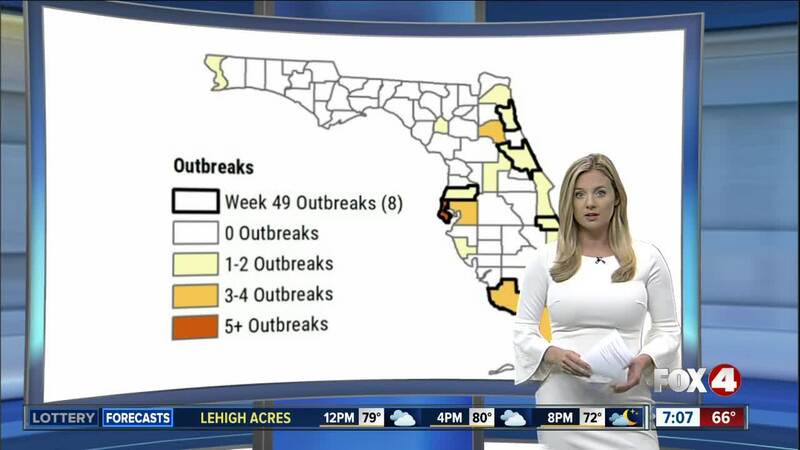 LEE COUNTY, Fla. -- More flu outbreaks are popping up across the country. The Centers Disease Control and Prevention has a recent map that shows the flu has increased in several states over the past two months including Florida. It went from local to regional flu activity in the past week. The Florida Department of Health said there have been 8 new outbreaks, making it a total of 37 so far across the state this flu season. Several counties are experiencing flu outbreaks including Collier County, which has seen as many as 4 outbreaks this year. At this time, most of the state is experiencing mild flu activity. Health officials said most people are testing positive for Influenza A H1N1. A lot of these outbreaks have been in schools, camps and daycares. So far, two unvaccinated children in Florida have died from the flu this season. Doctors said the best way to prevent the flu is to get a flu shot. The state said you still have time to get one this year and it's especially important for children to get one. A flu shot can lower a child’s chance of dying from the flu by up to 60%. Health officials said flu activity will continue to rise in the upcoming weeks.